Resistance through art, or as I like to call it “white resistance,” is where art arises as a form of struggle itself. Resisting anything that is unjust needs a tool. My tool in jail was my pencil, my poetry and my feelings. With these I wrote and I drew. 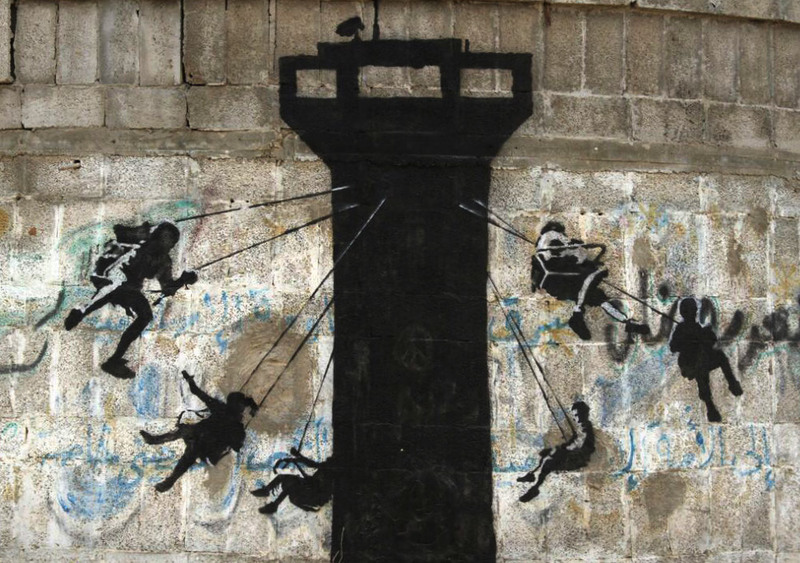 There are many ways of expressing resistance to the occupation through art. For me art has become the only peaceful weapon available to express and transmit all of the ways in which I suffer to the world. Resistance through art, or as I like to call it “white resistance,” is where art arises as a form of struggle itself. 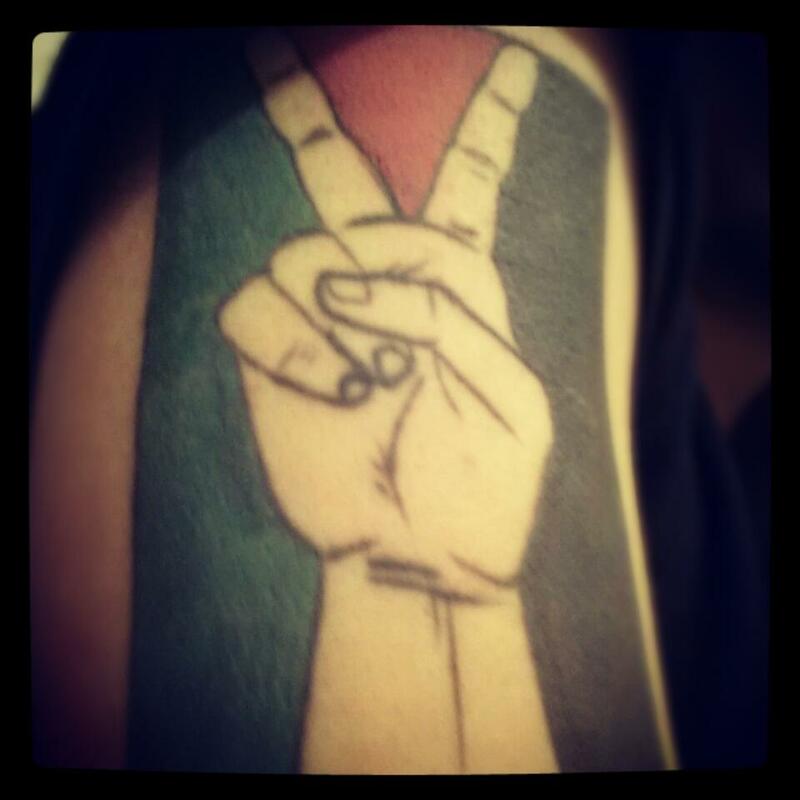 Artists in Palestine do not want to paint an image of resistance in their art, but aim as much as possible to make art a weapon through which they resist everything that is unjust, whether it is against the occupation, war, wrongheaded social norms and traditions, killings, violence or anything that is corrupt or contradicts humanitarian values. My love for drawing only started when I was under house arrest. I started to draw my feelings while locked inside my room to release all the negative energy that was built up in my heart as a result of detention, especially because I was deprived of practicing my love of photographing outdoors in places I loved to visit. Therefore, drawing came to give me a positive push to keep me going, resisting and struggling, and to replace my passion for photography and no longer free use of my camera during this long period of time. After I was sentenced to five months of jail and during my time at Damon prison, my need to write, and more than ever before, became a way to express my resistance against jail and the injustice I faced every day due to the imprisonment of my freedom. However, suddenly and with writing, I felt capable of drawing too and expressing all I saw and lived in this jail through simple drawings that transfer reality as it is, and the feelings I or other women prisoners lived. The Israeli Prison Services ban us, Palestinian women prisoners that is, from using colors, paints, books and all drawing equipment, yet they allow them in criminal prisons. This ban and restriction was not an obstacle for us. Whoever wanted to draw and express her feelings in jail would do so with the minimum of available means. The drawing equipment I used in jail was very simple. I illustrated with pens in three colors, blue, black and red, and a pencil that is the only available one in the section where I was assigned. It was secretly smuggled, used by all prisoners who wanted to use a pencil. In order to use it one would wait in turn and pre-reserve. My eraser in jail was merely a small piece of black leather on the handle of a hair brush and my sharpener for the pencil was the cement ground of the prison’s yard; I would scratch the pencil to the ground until it became good for drawing. As for the drawing paper I used in jail, they were the paper of a regular lined book that I use for writing. Sometimes I would collect the cardboard covers of disposable aluminum plates, used for special meals given to prisoners with diabetes or blood pressure diseases. These would only be available for me to draw on if the covers remained clean and unstained by food. I then gave these drawings to my prisoner friends to keep. Today, after being released and having all drawing equipment available, I still feel that the drawings I drew in jail had more meaning and are different than any other drawing I do while free at home. My drawings from jail are very simple. To the observer’s eye they may seem to lack mastering and the real technique of drawing, however, they came from a suffering heart, deprivation and a lack of equipment and means. Thus they have a big place in my heart. Each drawing I drew in jail, even if it was simple and merely some momentary scribbles, has a meaning that I lived in jail and a visualized message about something happening that only women prisoners themselves know. These are some of my drawings from jail, each has a story. Picture no. 1: As soon as I arrived into jail, all of my belongings were confiscated. I was even banned from bringing in my own clothes. The jailer cuffed my hands and shackled my legs. When I objected and asked her why, she said because I am a security prisoner and I am a threat to the security of the state and jailers. After arriving into section 61 of the Damon prison I saw two cells: cell number 7 and cell number 8, everything fenced, locked and surrounded with walls, even windows were sealed with iron and fenced from every side. Picture no. 2: During the times where I would sit in my cell empty of all that is lively, hopeful and colorful, I would look at its corners and see gray walls and beds, and in front of me. Wherever my eyes would look, and because of how small this cell is, I would see the closed gray door. Suddenly, I felt a desperate need for my eyes to see colors, to see a different color than the dominant gray in this cell. I wished that I had paint to color that door with other colors full of life and optimism or colors that tell the reality of feelings that moved inside me and the seven prisoners with me. Nevertheless, my wishes would not get me anything. I opened my book and drew the door of the cell as it is. Then I started to color it in with the colors I had available in accordance with my feelings and sensations. Red, was for the feelings of love and longing that I had for my friend at that moment; black was for the darkness of the cell and the noise I lived all the time with the prisoners and the lack of privacy; and blue symbolized the occupation that always disturbs the clarity of our lives for us Palestinians. The state of longing produced inhibitions, contradictions, pain, hope and agony that I found here, and released through the colors engraved in the drawings. Picture no. 3: There’s a story about the sea in jail. I had missed the sea a lot when I drew this drawing but there is something deeper that controlled my feelings and was tougher on me than longing itself. When I thought of the sea, here, I saw women prisoners and their longing to see this sea! Talking about the sea anywhere in the world is something normal but talking about it in jail and in Palestine, and specifically with Palestinian women prisoners, had a certain pain. All the women prisoners I was with had not seen the sea in their lifetimes but through pictures due to checkpoints, the separation wall and the occupation that prevents Palestinians in the West Bank from visiting the coastal area. Many were deprived of permits that could have helped them cross these checkpoints. Generations have grown up and are still growing up in Palestine and have never gone to the sea and do not know the real meaning of the sea, its contours, or the feeling one has when swimming. I did not have the color green with me in jail which kept me from finishing the Palestinian flag on the boat’s sail in the drawing. I felt banning color pencils was similar to the confiscation of Palestinian rights to see the sea. Despite the fact that both of these requests are humanitarian and very simple—indeed the simplest of human rights—yet banning them causes deep pain and leaves an indelible effect in the heart. Picture no. 4: Some of the darkest feelings that overtook my heart while in jail came from the longing for a friend. I felt loneliness, suffering, love, and pain. I called out for those my heart missed without anyone hearing so much as an echo. That is when I wanted to shout and yell her name, but it was of no use. My voice could not reach her from behind the iron door. So I imagined a conversation transmitted by our hearts. But in reality any sound I made was buried inside of my cell. Love was buried; the heart was bound and the call was only received by the walls of this prison. Pictures no. 5 and 6: These images are of the beds in the cell. Constructed of iron and topped by a very thin mattress, sleeping on them was like sleeping on a sheet of tinplate. The uncomfortable mattress caused me back pain. There was nothing in the cell but these beds and gray lockers. This was the only furniture available for women prisoners. Picture no.7: That iron door is the harshest scene I have seen in my life, escorting me at all time and through the opening where I could always see the sky in a square. A huge iron door, I often had the feeling to and wished that I could break that door, or open it and leave whenever I wanted. What a hard feeling it is to be tied to place where the times to open and shut the door on you are controlled. At this specific moment when I made this drawing, I felt an urgent need to get out and breathe. I even wanted to shower whenever I felt the need to wash my body of the tiredness of thinking, with cold water, but also could not do that as shower rooms are also tied to certain times that I do not control. I went with imagination towards freedom. I wanted to put a hole in that door. I started drawing circles on it, yet, these holes suddenly appeared as extra restrictions. That door is a symbol for the ruggedness of the jailer and my inability as a prisoner. The only way for me to open that door was writing about it or draw it as open like it was in my imagination. Picture no.8: In the cell, lights are turned off at 11:00 p.m., and at this exact time rooms become quiet and silence begins after a day full of indescribable noise. That is the only time I would have a state of quietness that would help me write and read in jail, but my problem was that there was no light to help me read and write. The only available light came from a small opening in the door that beamed into my cell. I would sit on the ground by the door to use this, the only light entering the cell. Under this light I wrote my poems and drew some of these drawings. Picture no.9: Being imprisoned only because of writing where my only crime was having used a pencil to write a poem, I came to see freedom of expression and democracy in Israel as a big lie; there is no such thing as the freedom of expression for us Palestinians. The pencil represents me, the pencil here is my imprisoned body. It is also the pencil that we as prisoners are banned from using; this ban itself is a symbol of the racism we face. Pens of all types are available in Israeli criminal prisoners but are banned for political prisons where only Palestinians are held. A state that imprison a poet because she wrote a poem and bans pencils in that prison, it is a racist not a democratic state. To me, more writing and more drawing means more resistance and more struggle against the occupation and its acts against us Palestinians. More art means more holding onto the land, history and identity. 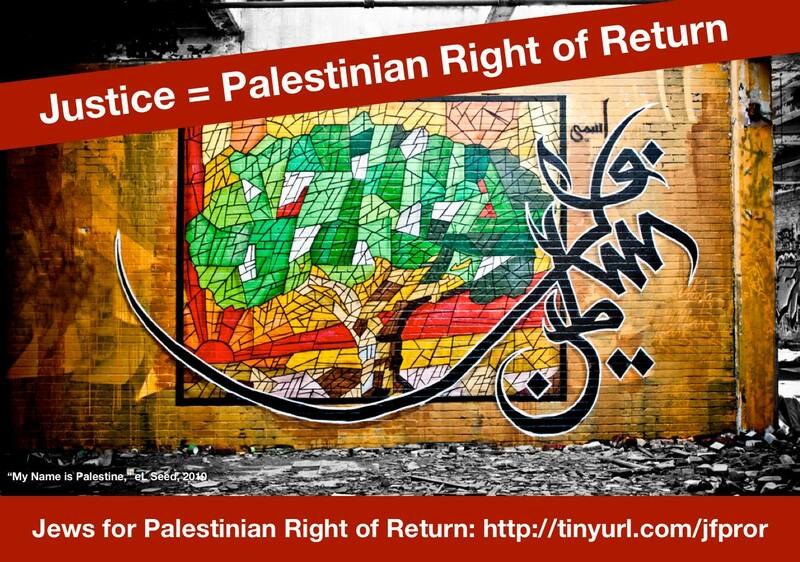 It means more expression where injustice is rejected, and publicly saying “no” to occupation. Those who have a talent live with a cause, and artists who have a cause in their art do not let it go no matter how expensive the price is and no matter how much forces beyond their control try to silence them. With censorship, artists back their causes even stronger and in additional means. Thus, in inaccessible places and where nobody can know what is happening in terms of human rights violations, comes the talent who will express what is hidden, comes art in jail to specifically send an image to the outside world and tell on and document these violations. After I being imprisoned for three years for writing a poem against the occupation, I do not rule out that I could find myself in detention once again. This time perhaps for a drawing or a picture depicting the occupation, expressing resistance or my Palestinian identity and my home country. A drawing in which I criticize all of the occupation’s violations and its racism against us Palestinians–because everything here that has a Palestinian identity has become incitement and terrorism for the Israeli government–could be called a crime. A look could be called a crime. Using certain colored pencils could be called a crime. After I was tried and convicted for a word and a thought, I wonder will I ever be locked up for a drawing too? I leave the answer here in two of the above drawings that I did while under house arrest. Maybe these will have an explanation of the reality I lived, am still living and will live in a state that only knows killing Palestinians, and fights everything that expresses them. This article was translated from Arabic to English by Nina AbuFarha. Israeli border police on Saturday arrested two Italian graffiti artists who were painting a mural of a jailed Palestinian teenager, Ahed Tamimi, on the Israeli separation barrier in Bethlehem in the West Bank, according to Palestinian officials. Tamimi, now 17, was sent to prison for assault after being filmed kicking and slapping an Israeli soldier late last year, when she was 16. She is due to be released on Sunday. Tamimi became a heroine to Palestinians after the Dec. 15 incident outside her home in the village of Nabi Saleh was streamed live on Facebook by her mother and went viral. An Israeli police spokesman did not return a call for comment. The Palestine Liberation Organization said on Twitter that Israeli forces had arrested the two Italian artists and a Palestinian who was with them. The mural appeared on the separation wall in Bethlehem just days before the 17-year-old activist is due to be released. An unknown artist has painted a mural of Palestinian resistance icon Ahed Tamimi on the Israeli separation wall in Bethlehem, just as her father said she might be released on Sunday after almost eight months of unjust imprisonment. 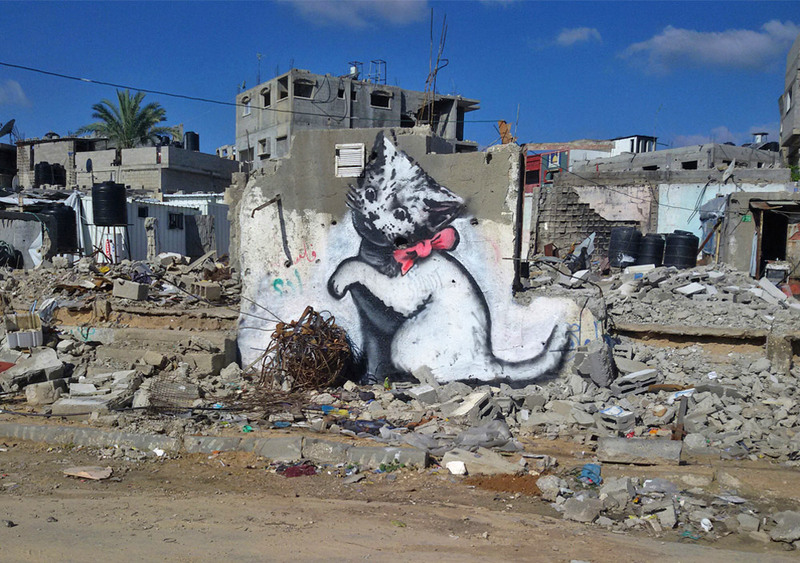 Media outlets had speculated about the artist’s identity, some describing him as Palestinian, but he has since come out as Italian street artist Agostino Chirwin. Also known as ‘Jorit Agoch,’ he has a reputation for hyper realistic murals of activists, politicians and other campaigners. While painting the 13-foot mural, Chirwin obscured his identity by keeping a black cloth wrapped around his head. Ahmad Arabi, an activist from the Popular Resistance committee in Bethlehem, said the mural was part of the preparations to celebrate Tamimi’s release. Tamimi, 17, recently told Egyptian news outlet Al-Ahram Gate she had completed her high-school diploma in prison and that she was getting ready to apply to the Law or Political Science faculty. The streets of Bethlehem, Nabih Saleh, the West Bank and occupied Palestine in general are readying to welcome Tamimi, who was sentenced to eight months in prison after a video of her slapping and yelling at an Israeli soldier who had entered the family home went viral. Tamimi’s 15-year-old cousin, Mohammed Tamimi, had been shot in the head with a rubber-coated steel bullet a day before. Tamimi was charged with aggravated assault, obstructing the work of soldiers, and incitement on January 2. “The Israeli authorities usually do not inform the detainee or his family of the date of release, but I think she will get a decision” to reduce her detention by 21 days, said Bassem Tamimi, her father. Irish artist Jim Fitzpatrick Gallery, famous for creating the iconic image of Che Guevara, has released an image of Ahed Tamimi cast as the real Wonder Woman. On the concrete barricades erected by Israel for security purposes around parts of Bethlehem giant spray-painted images of Trump have given Palestinians some comic relief. “I’m going to build you a brother,” the US leader tells the wall in one mural. In another, he hugs an Israeli army watch-tower, with heart-shaped emojis added alongside paint splashes and soot stains left by Palestinian demonstrations. Artist sprays on Israel’s security barrier a caricature of US President Donald Trump, mocking his planned construction of a wall along the Mexican border to stem tide of immigration. US President Donald Trump’s promised wall along the Mexican border may be a tall order, but at least he has left his mark on the Israeli security barrier that he has promoted as a model. The artist, who goes by the alias @LushSux and who Australian media have said comes from Melbourne, did not immediately respond to a request for comment. On Thursday, the Washington Post published a transcript of a conversation in which Trump pressured Mexico not to publicly oppose his plan to have it pay for a border wall that he says is needed to stop illegal immigration to the United States. “You know, you look at Israel—Israel has a wall and everyone said do not build a wall, walls do not work—99.9 percent of people trying to come across that wall cannot get across and more,” Trump told Mexican President Enrique Pena Nieto, according to the transcript of the phone call in January. “Bibi Netanyahu told me the wall works,” he added, using Israeli Prime Minister Benjamin Netanyahu’s nickname. It was bound to happen. A guerrilla graffiti artist painted an image of Donald Trump on Israel’s separation wall inside of the West Bank city of Bethlehem in the early morning hours Monday, mocking the president’s repeated statements on his intention to build a wall along the U.S.-Mexico border. The Trump mural is based on widely circulated photographs of the president visiting Jerusalem’s Western Wall last May during his first trip abroad. Trump’s stop at the Jewish religious site stoked controversy and a number of memes. The wall is located inside of East Jerusalem, occupied by Israel in 1967. Trump became the first sitting U.S. president to pray at the wall. “Who paid for you?” he whispered. But the old wall keeps her secrets. Read full report by clicking on link …. ‘The Walled Off Hotel’ in Bethlehem, with a view of the separation barrier, will officially open March 11th and comes complete with dozens of pieces of art work by British artist Banksy; artist is known for politically-charged work and has visited Israel and the Palestinian territories in the past. Under an army watchtower and across the street from the concrete wall Israel has built in parts of the occupied West Bank, street artist Banksy has opened a guesthouse in the Palestinian city of Bethlehem. In the revered birth town of Jesus, the Walled Off hotel stands three storeys high. Its bedroom walls and hallways are decorated with the mysterious artist’s stencil graffiti work — one shows an Israeli soldier and masked Palestinian youth having a pillow fight, and a statue of a chimpanzee bell-boy stands at the entrance, clothes falling out of the suitcase he holds. The hotel, converted from a pottery workshop, has been styled to resemble “an English gentlemen’s club from colonial times,” a statement from the artist said, in acknowledgement of the historical role Britain played in the Middle East. But the decor has been spiced up with statues choking on tear gas, cherubs hanging from the ceiling, their faces covered by oxygen masks and oil paintings of refugee life jackets washed ashore. The hotel was set up in secrecy over the last 14 months — Israeli military authorities in the West Bank did not immediately respond when asked if they had been aware in advance. Banksy, whose real name is not known, described his guesthouse as having the worst view of any hotel in the world: Every room overlooks the barrier which is a symbol of oppression for the Palestinians. Israel began building it in 2002 at the height of a Palestinian uprising in which Israeli cities were rocked by frequent Palestinian suicide bombings. Palestinians dub it an “apartheid wall” and an Israeli attempt to grab land in the West Bank, which they want along with Gaza and East Jerusalem, for a future state. The Banksy statement said the hotel “offers a warm welcome to people from all sides of the conflict and across the world” and was financed by the artist. Gentle music from a self-playing pianola fills the candle-lit dining room where a framed painting of Jesus looks up at three warplanes, stenciled on the wallpaper above. The hotel also has its own art gallery and an exhibition dedicated solely to the wall, which features contributions from Palestinians and Israelis. The Walled Off is Banksy’s biggest project since the 2015 “Dismaland” theme park at the English seaside, where staff carried balloons proclaiming “I’m an imbecile” and model boats full of refugees floated in a pond. 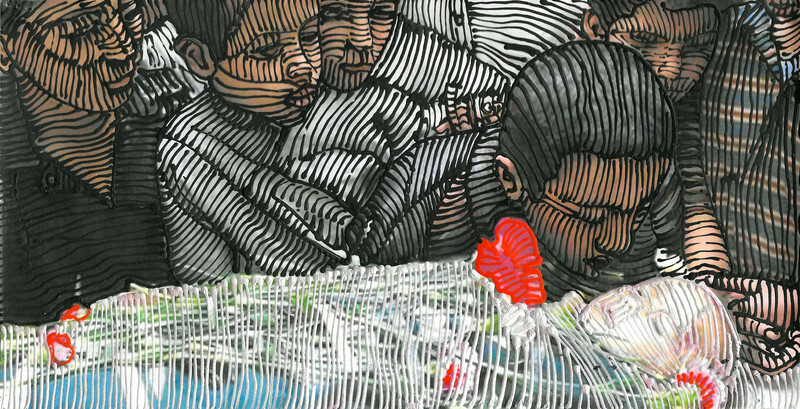 The artwork, “Besieged Childhood,” has garnered renown for its creators. It depicts a child wearing a keffiyehscarf, a melancholy expression on her face, her hands wrapped around two bars, like those of a prison cell. Twenty meters high and 15 meters wide, the mural on a wall of a 12-floor building in Gaza City is unmissable. Its location, on the Zafir 9 Tower in an upmarket area of Gaza City, is deliberate. During Israel’s 2014 assault, fighter jets destroyed one of Zafir 9’s sister towers, Zafir 4, in a bombing denounced as a war crime by Amnesty International. 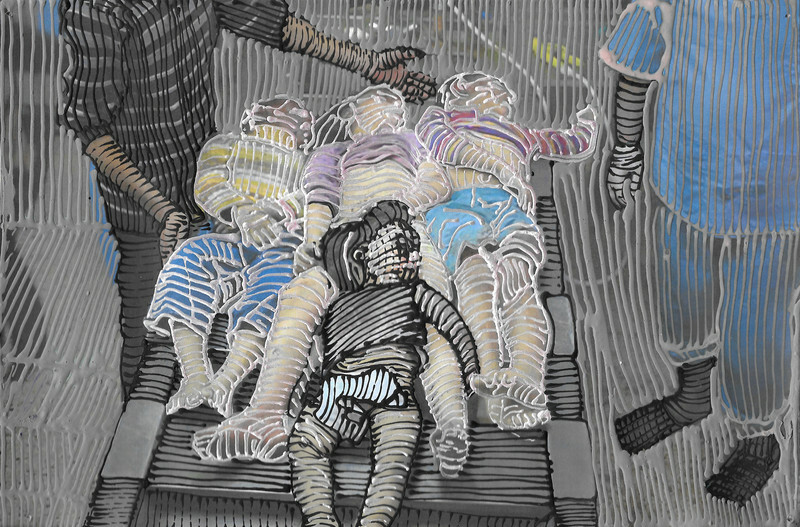 “Besieged Childhood,” painted in 2015, references this wanton destruction, said one of its four creators, Belal Khaled, 25. “Zafir Tower bears witness to criminal Israeli acts during wars that targeted a [highly populated] residential tower. 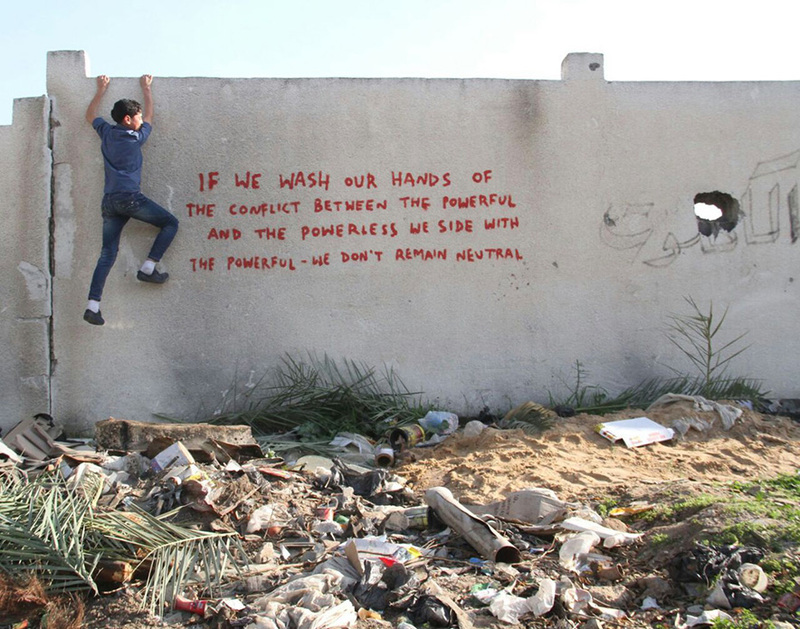 The mural is a way for us to communicate this reality to the world outside Gaza,” he explained. Over the last decade, Gaza has been subjected to enormous destruction. Three overwhelming Israeli military offensives and a decade-old blockade on goods and people entering and leaving, preventing any kind of recovery, have left thousands dead, tens of thousands injured and homeless, caused widespread psychological trauma and damaged infrastructure so completely that the United Nations has warned the coastal strip may be uninhabitable by 2020. In this devastation, media coverage has had little ameliorating effect and it is no surprise that a frustrated populace is turning to other means to voice their frustration, anger and pain. It was from a desire to convey Gaza’s suffering that the “Besieged Childhood” mural was born, and it was also a “message,” said Khaled, that artists will not be silenced. “Gaza may be besieged, but it has artists who are capable of absorbing what is happening in Palestine and conveying this to the outside world in different, creative ways,” said Khaled. Khaled graduated from Al-Aqsa University’s art college and lives in the city of Rafah in southern Gaza. He started out as an artist 10 years ago in photography and sculpture, but he soon moved on to calligraphy art and murals. Graffiti is a well-worn and time-honored path for a Palestinian artist, originating in the years before the first Palestinian revolt against British rule in 1936. To my sister: Do not grieve. While the identity of the prisoner is unclear, most believe the poem was written by Awad Nabulsi of Nablus. His verses later became a revolutionary song, “From Acre Prison,” which has been passed down from generation to generation. Some of these cell-wall writings still exist, according to Emad Qassem, 61, who said he was arrested in 1978 and accused of taking part in an attack on three soldiers on patrol in Beach camp in Gaza City, where he lives. Qassem said he spent six months in solitary confinement in Naqab prison, studying the “drawings and scribblings” of those who came before him. Some were signed and dated all the way back to British Mandate times, he said. Qassem joined those who had come before. With stones or coal from the floor, he drew, he said, what he had in his mind. One depicted a mourning mother, one was a freedom logo, and one was a broken chain. The practice has continued and spread. Almost every street corner in Gaza is adorned with some kind of mural or writing. Most of it is openly political, some of it factional. Much of it tells the history of the Palestinian people’s suffering. 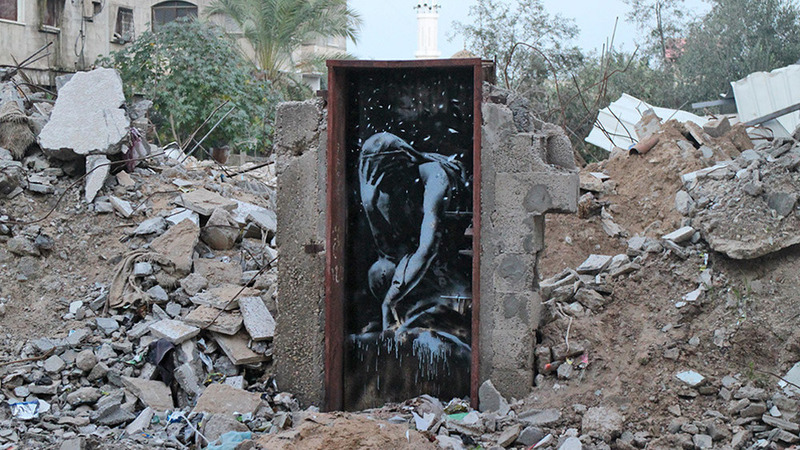 During the 2014 assault on Gaza, Khaled combined news photos of Israeli airstrikes and digital tools to create his own kind of graffiti-photography. Adding drawings to photos of bombings gave him the opportunity to infuse some meaning into the destruction. “The photos of bomb smoke were widely spread [on social media] during the war so I tried to create something unique with them. I drew a weary old man, a woman wearing the keffiyeh, a child playing, a young man raising his hands praying to God and a heart to express Gaza’s hope to live in peace,” Khaled said. His was a response to violence that built on the examples of artists in the first intifada. It was during those years, 1987-91, that graffiti really took off as an expression of resistance. Palestinian factions used the medium as a means to convey news, make announcements and simply for bragging rights: competition over which faction had the best artists even began to spring up. Hassan al-Wali, 54, lives in the Jabaliya refugee camp in Gaza City. During the first intifada, al-Wali, then with the Popular Front for the Liberation of Palestine, and his friends were some of the most active graffiti artists in the coastal strip. He remembered his favorites, some of which still adorn the walls of Gaza’s camps. There were the Palestine map drawings, the always-popular key, a reminder of the the homes left behind by refugees during the ethnic cleansing by Zionist militias 1948. 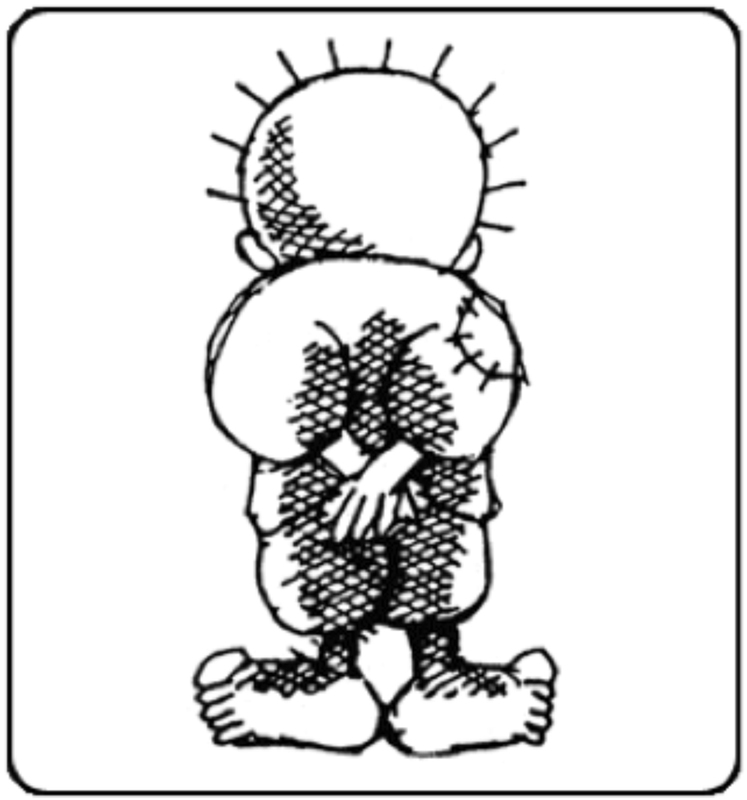 He drew assassinated cartoonist Naji Ali’s famous Handala character, the logos of the factions and many more. They covered their faces and moved only in the alleys of the camp. It became, he said, a dangerous task that Israeli soldiers began taking more and more seriously. If caught, it could result in death or arrest. “Wall murals, graffiti, whatever you call it — it is the art of resistance,” said al-Wali. Sarah Algherbawi is a freelance writer and translator from Gaza. The history of modern Palestine can be traced through the work of its artists. After the 1948 ethnic cleansing of Palestine, what has become known as the Nakba, the theme of refugees — “hopeless, helpless and without homes” — dominated. “The Palestinian woman with her nice dress, flowing hair and long neck: the woman is a symbol of the revolution,” he says. Jerusalem soon became a symbol for Palestine, and Mansour is perhaps best known for his painting of an elderly man carrying its walled Old City, with the Dome of the Rock as its crown jewel, on his back. “The main idea behind our work was to try to promote and develop and show that there is a Palestinian people and Palestinian identity and culture,” he says. Artists like Mansour didn’t choose to be political, but were only responding to their environment, he adds. Mansour and his comrades in the Palestinian Art League printed their work on posters to reach the widest audience possible. Their work was wildly successful. “You can find Palestinian art posters in every home,” he says. Israel began censoring Palestinian artists, and banned the colors red, white, black and green — the colors of the Palestinian flag. During this time in the late 1980s known as the first intifada, Palestinian artists began working with natural materials, in observance of the boycott of Israeli products. “Instead of painting a landscape, I will use the land to paint,” Mansour recalls thinking. Mansour was once part of an initiative to try to change Israeli public opinion through art, under the banner of ending the occupation. 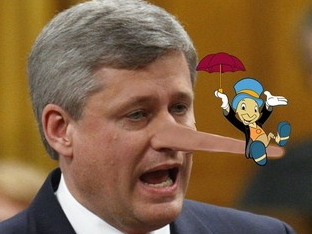 “We came to a conclusion that it is not working … so we stopped,” he says. *Linda Paganelli is a visual anthropologist based in Palestine. 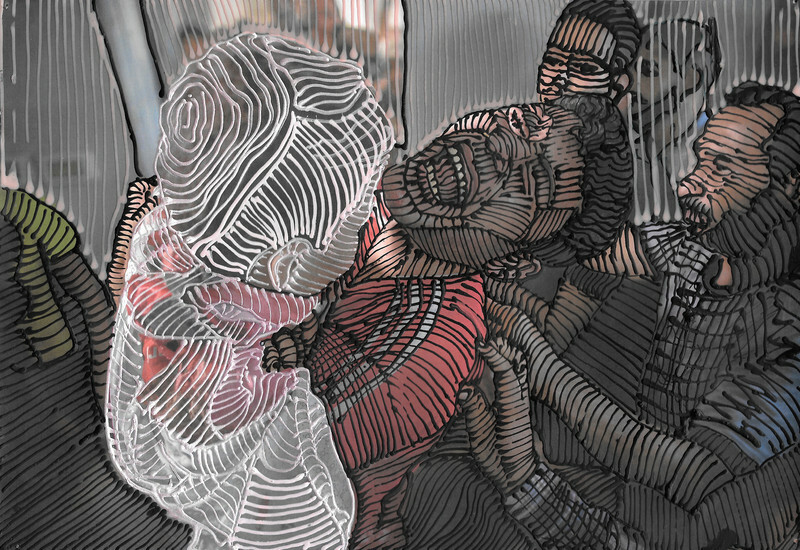 The artist drew delicate lines over 50 photographs selected from the deluge of horrific news images of Gaza that flooded social media during Israel’s war last summer. With Scholnick’s intervention, the images are slightly abstracted, but also given further depth. The video below has had nearly a million views since it was posted last night …. We love Banksy — who doesn’t? 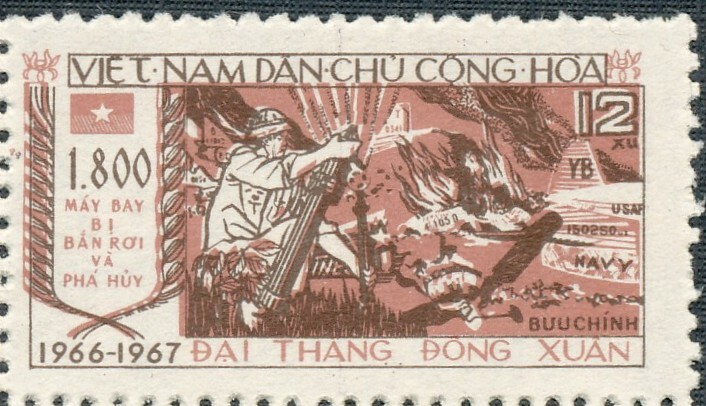 Horrors were turned into works of art during the war in Vietnam …. Parts of those planes shot down were hand crafted into beautiful rings which had the number of the plane shot down on the inside. There were given out as gifts to anti war activists in the US and Canada …. truly a badge of courage for the recipients. “I like the idea of making something beautiful from these devices which kill us: I will take the vase home and regularly put roses in it,” said Khder Abu Nada, a 32-year-old whose cleaning business was destroyed during the war. As donors pledge billions to rebuild Gaza in the wake of Hamas’s war with Israel, one Gazan is engaged in another type of construction: turning remnants of the war into works of art. Hossam al-Dabbus, a 33-year-old who works in Gaza’s honey industry, has collected shells, rockets and missiles from the war that killed around 2,2000 Gazans and more than 70 Israelis — and turned these objects into flower vases. Dabbus, who lives in Gaza’s Jabaliya refugee camp, first found his materials by combing through the Gaza wreckage. As orders poured in for his art, he asked Hamas police for more defunct projectiles from the war. “When my children grow up I’ll be able to show them these and tell them — here are remains of the 2014 war that left over 2,000 people dead, and this is how I transformed an instrument of death into a vessel of life, making these bombs into flower vases,” Dabbus told Agence France-Presse. His customers say they appreciate the symbolism of the artwork. 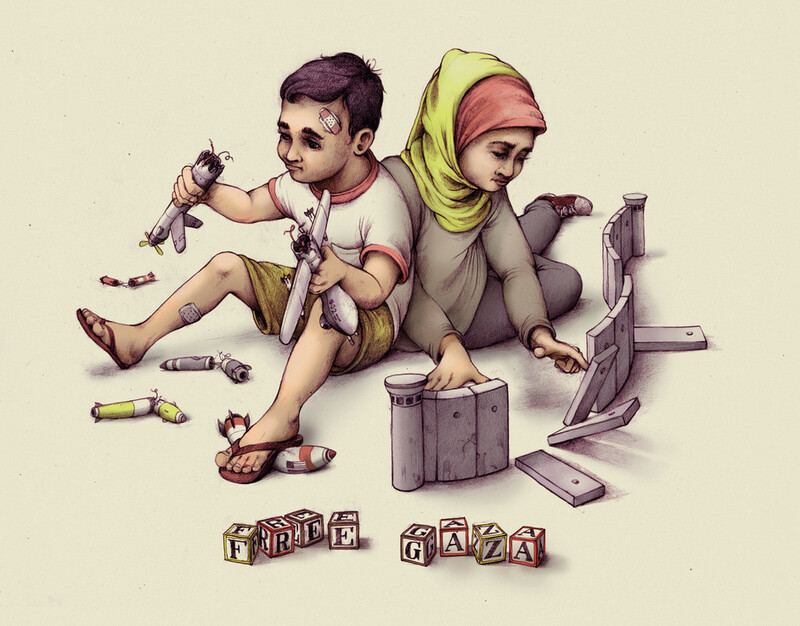 In the middle of the 50-day war, Gazans were also making art by drawing images of war over photographs of bombed buildings. Pat Perry is an artist from Michigan. He currently lives and works itinerantly in the US. This image was created for Imaging Apartheid, a Montreal-based initiative aimed at bringing awareness and support to the Palestinian struggle for liberation through the production and dissemination of poster art. 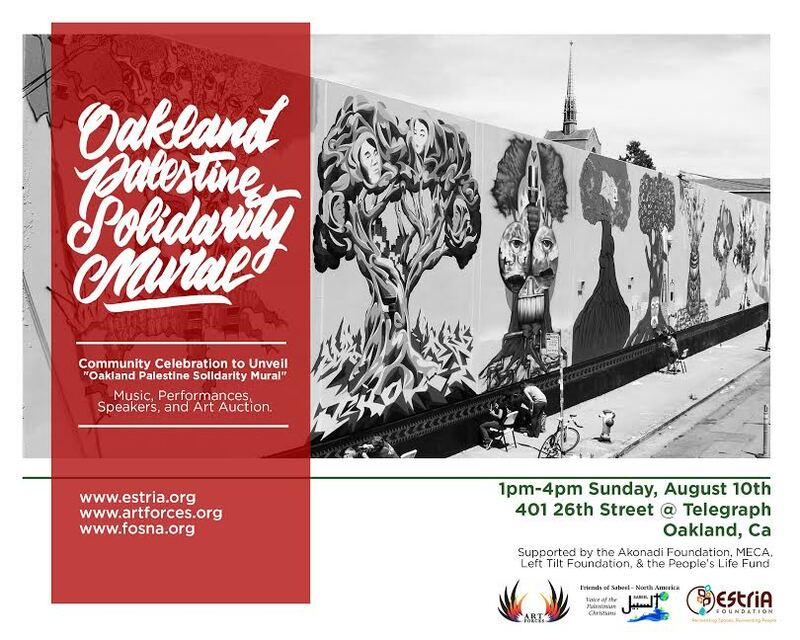 Presented by Art Forces, the Estria Foundation and NorCal Friends of Sabeel, the Oakland Palestine Solidarity Mural is a monumental work of public art located in Uptown Oakland on 26th Street between Telegraph and Broadway. The mural pays homage to the history of Bay Area public art and expresses solidarity with Palestinians as bombs continue to fall on Gaza. 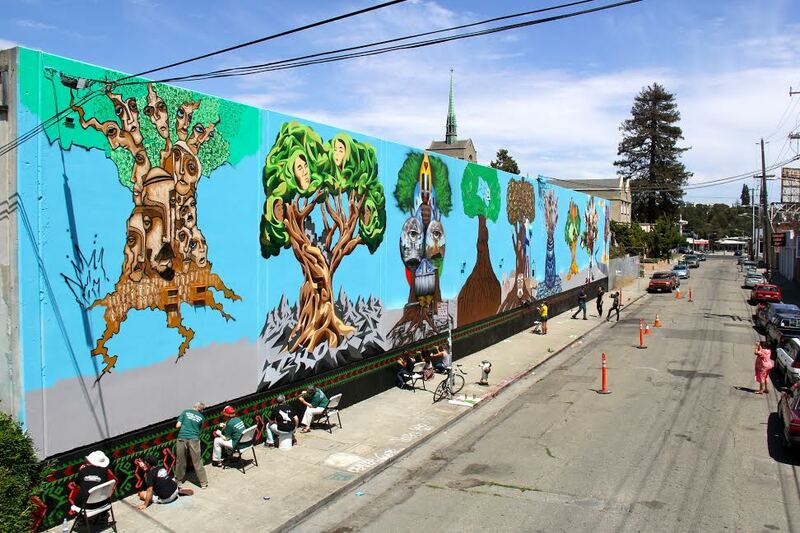 The Oakland Palestine Solidarity Mural adopts the image of the tree as a central motif and global visual signifier to link seemingly disparate issues and distant locations. Spanning 157 feet and reaching 22 feet high, the mural is comprised of nine separate panels, where each artist or team of artists has painted his or her own interpretation of a tree to address social and political issues. These issues include the shared histories of colonization, environmental exploitation, internal exile of indigenous peoples, resilience and resistance to these injustices. The mural dedication will be held on August 10, 2014 from 1-4 pm and is free and open to the public. The dedication will include poetry, music, traditional Palestinian dance, local stiltwalkers from LocoBloco and an art exhibit From Gaza to Oakland. This exhibition includes artwork from Gaza artists and photo journalists responding to the recent assault; historical photos of the expulsion of Palestinians from what is now called Israel; print portfolios from Middle East Children’s Alliance and work by muralists and friends of Oakland Palestine Solidarity Mural. This exhibition will open in conjunction with the mural unveiling on August 10th and will run through September 30, 2014. The twelve participating artists come from a wide array of backgrounds, ethnicities and cultures. They include Dina Matar, who is participating virtually (Gaza); IROT (Native American); VYAL (Chicano-Native American); Deadeyes (African American); Erin Yoshi (Japanese American); Susan Greene (Jewish American); Emory Douglas (African American); Nidal El Khairy (Palestinian); Chris Gazaleh (Palestinian American); SPIE (Asian American); Fred Alvarado (Latino American); Miguel Bounce Perez (Chicano-Pacific Islander American). First, from Wikipedia ….. Art may be characterized in terms of mimesis (its representation of reality), expression, communication of emotion, or other qualities. During the Romantic period, art came to be seen as “a special faculty of the human mind to be classified with religion and science”. 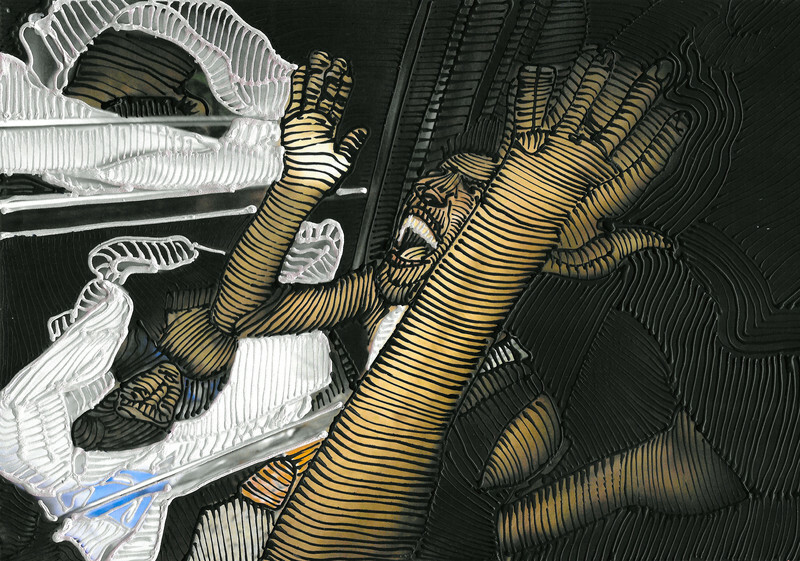 Though the definition of what constitutes art is disputed and has changed over time, general descriptions mention an idea of imaginative or technical skill stemming from human agency and creation. The City of Ottawa will not close an art exhibit denounced as a glorification of terror by Israel’s embassy and the local Jewish community. “Invisible,” the creation of Toronto-based Palestinian artist Rehab Nazzal, focuses on “Palestine … and its military occupation by Israel,” according to a gallery brochure. The exhibit, which is scheduled to end June 22, has been on display at a gallery inside Ottawa City Hall since May 9. Rafael Barak, Israel’s ambassador to Canada, met last week with Ottawa Mayor Jim Watson to discuss “the problematic nature of the exhibit, especially because it does not portray ‘artists, activists, writers and leaders,’ as is presented in the pamphlet, but known terrorists,” said a statement from the embassy a day after the meeting. The statement added that the artist is a relative of Khalil Nazzal, who masterminded the Maalot school massacre in Israel that took place 40 years ago this month that killed 22 children and three adults. The Jewish Federation of Ottawa and the Centre for Israel and Jewish Affairs called on the mayor to remove the “inappropriate” exhibit, which is “hurtful to the Jewish community and offensive to any peace-loving person, including non-Jewish Canadian victims of terror,” the federation said in a statement last week. But the city advised the federation that it was unable to remove the exhibit, “citing deficiencies in its own selection process,” said Jewish Federation of Ottawa president and CEO Andrea Freedman. Share these as widely as possible …. 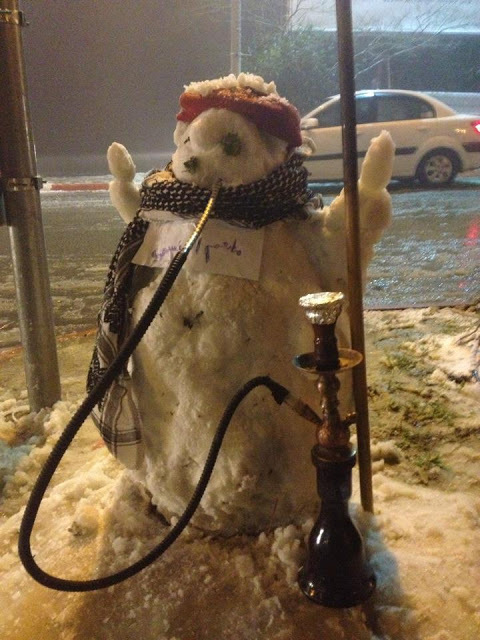 Yesterday’s snowstorm resulted in the following artistic expressions in Palestine …. a fun day for all! 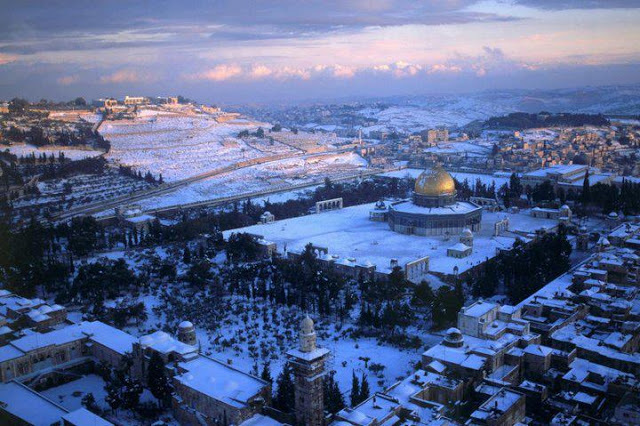 Through the gates and behind the walls, the crown jewel of Jerusalem’s skyline, the Dome of the Rock, can be seen here amidst surrounding snow covered domes. What’s this? 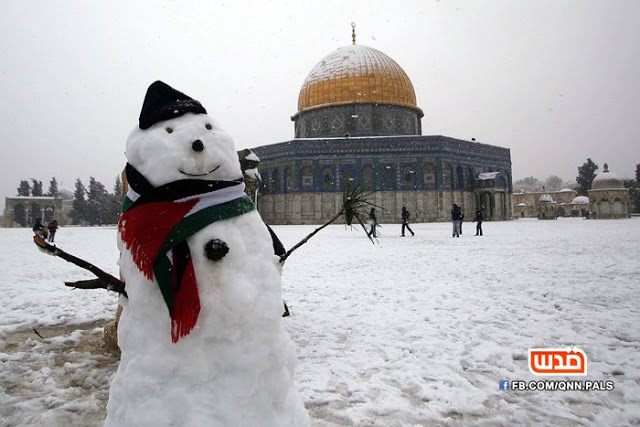 A Palestinian snow man visits the Dome of the Rock. While snow is certainly a welcome distraction for life under occupation, it is also a vehicle for political expression. 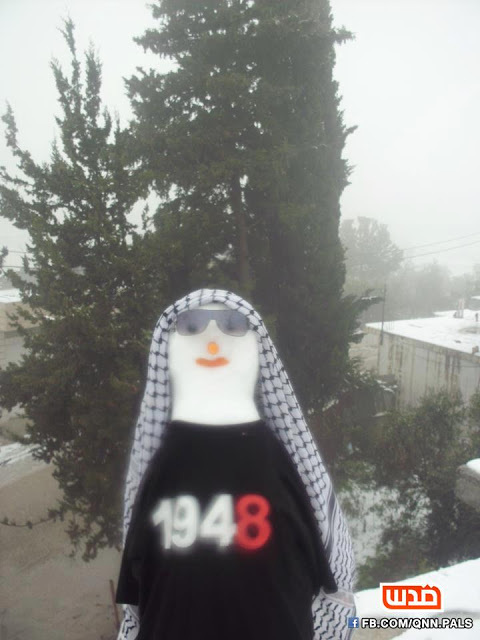 This Palestinian snowman commemorates the Nakba, or the depopulation of Palestine in 1948. 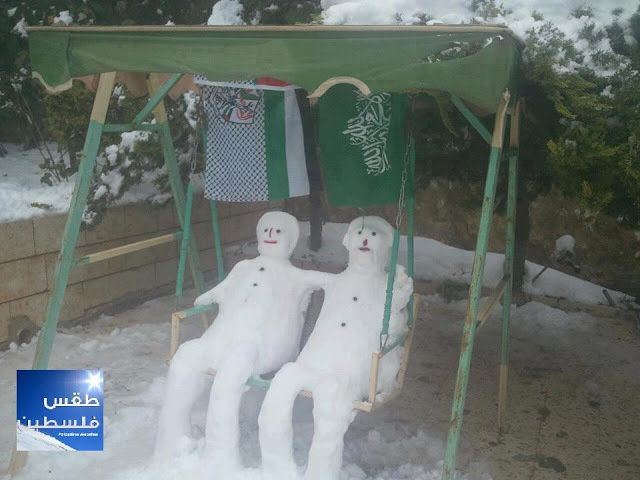 While some used the snow to show their party allegiance, others used it as a call for unity and reconciliation between Hamas and Fatah. Some snowmen wanted nothing to do with politics at all. The poster tradition is an exceptional element of Palestinian cultural heritage, and the posters themselves are important repositories of primary data. Palestine posters created by artists at the time of the first Intifada provide a unique lens through which today’s audiences can gain insight into the attitudes and aspirations of people directly involved in the resistance as it emerged. The Palestine Poster Project Archives contains 230 posters in its “Intifada” Special Collection (posters that contain the word “Intifada” or obvious visual references to the Intifada). Below is a selection of twelve posters from around the first year of the Intifada that provide a representative history of that watershed event. Created by the Palestinian artist Sliman Mansour, this poster references one of the many grassroots organizations that helped coordinate Intifada activities. It combines iconographic elements common to earlier Palestine posters—the kaffiyeh, barbed wire, raised arm—with a new element, the stones. The most impressive feature here, however, is the expression of sumud (Arabic: steadfastness) in the human figure. He (or she) stands alone, but the barrage of stones signifies an entire population. The fact that the text appears in both English and Arabic indicates that the poster was meant to be understood by both Palestinians and the international community. The poster’s slogan, a quote from Khalil Al Wazir (Fatah’s founder, also known as Abu Jihad), provides an unequivocal endorsement of the resistance. The niqafa (Arabic: slingshot) emerges here as another iconographic symbol of the Intifada. 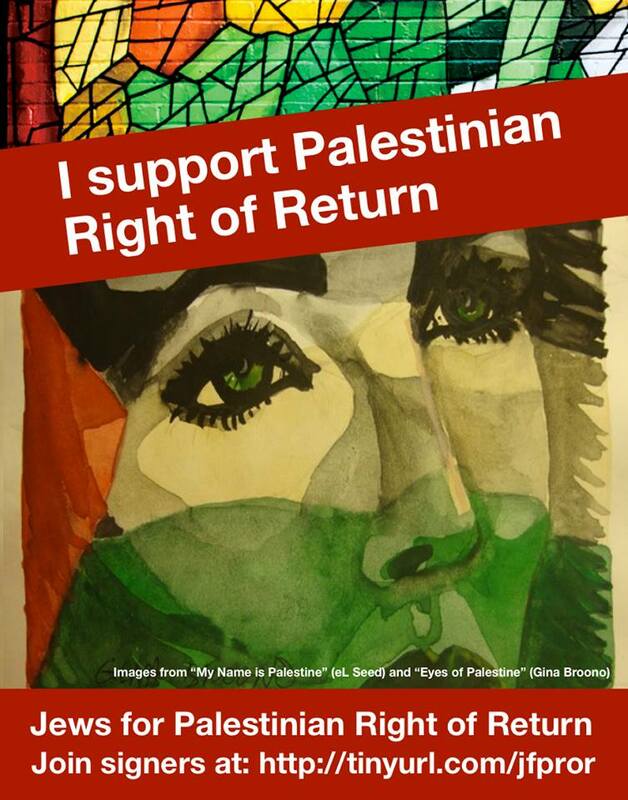 After 1988 Palestinian poster art also increasingly incorporated the Palestinian nationalist colors and flag, which were banned by Israel inside the occupied territories until the Oslo Accords of 1993. Published by the Popular Front for the Liberation of Palestine (PFLP), this poster provides further evidence that the Intifada quickly erased the distinctions separating diaspora Palestinians from those living under the occupation. The white horse, symbol of revolution in Palestinian iconography, is seen here in outline, having broken free and rearing its head in defiance. The horse straddles a destroyed Palestinian village, pushes past barbed wire, and tramples on the Star of David (a religious symbol self-selected by Israel as its political symbol). The Democratic Front for the Liberation of Palestine (DFLP) is another major political faction that immediately and unconditionally embraced the Intifada. Words and phrases such as “unceasing”, “steadfastness”, and “revolution until victory” are hallmarks of the Palestine poster tradition before, during and after the Intifada. The Intifada expanded the modes of resistance and so continues to this day in many forms, including among others Palestinian civil society’s call for a campaign of boycotts, divestment, and sanctions (BDS) of Israeli goods and institutions. The emergence of nonviolent resistance tactics against the Occupation is captured in this image of a young boy holding up his hand against armed Israeli soldiers and a tank. The steady gaze is a visual reference to the core Palestinian concept of steadfastness. Created by Vladimar Tamari, a Palestinian artist living (then and now) in Japan, this poster reflects the solidarity between Palestinians in the diaspora with those living under the occupation. The use of Japanese as well as Arabic and English text signifies an awareness of and connection to international solidarity. This poster was published by the Progressive List for Peace, a political party in Israel formed from an alliance of both Arab and Jewish left-wing activists (A Hebrew version of the same poster carries the caption, “Let’s Talk to the PLO”). The dove is a frequent icon in Palestine posters. Published by the Komite Internazionistak in Basque Country, this poster demonstrates the degree to which liberation movements around the world identified with and were inspired by the Intifada. The extreme youth of the child, whose fist barely encircles the rock, honors the role of young people as leaders of the resistance. The boy in this picture is Ramzi Aburedwan, now known as “Al Kamandjati” (the Violinist), who established The Kamandjati Association in 2002, which encourages young Palestinians to make music and so to transcend the hardships of the occupation. Prior to the Intifada, the heroic figures depicted in Palestine posters were the fedayeen (Arabic: militants) who engaged Israel in direct armed combat—usually men and, rarely, female militants such as Leila Khalid or Dalal Mughrabi. By contrast, the hero in this poster is a woman in traditional dress without a firearm. The use of the term “frontline” acknowledges both the dangers faced by Palestinian women participating directly in the Intifada as well as the expansion of the modes of resistance. The tatreez (Arabic: embroidery) decorating the stone heroicizes the participation of Palestinian women in the Intifada. As with the anti-apartheid movement in South Africa, a key strategy of the Intifada was to make the occupied territories ungovernable for Israel. The boy brandishing his slingshot and the burning tire indicate that a year into the Intifada, the Palestinian people were showing no signs of having been pacified. The Intifada opened a new day for Palestine. A population that been forcefully violently repressed and censored burst free in a unified effort for self-determination. It was also a new day for American artists, who were inspired by Palestinian acts of courage to take creative action in solidarity. This poster was included in a 1989 exhibit in Berkeley, California, titled In Celebration of the State of Palestine. Although nominally the exhibit’s theme was a subsequent event—Yasser Arafat’s declaration of the State of Palestine on November 15, 1988—its true inspiration was the Intifada itself. 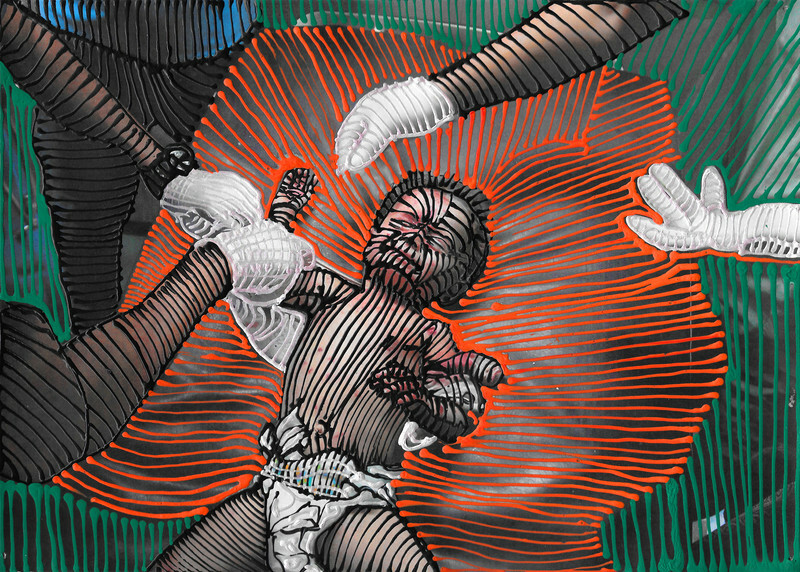 This can be inferred from the visual elements in many of the exhibit’s posters such as those seen here: the defiantly unarmed figure, the flag, and the kaffiyeh. 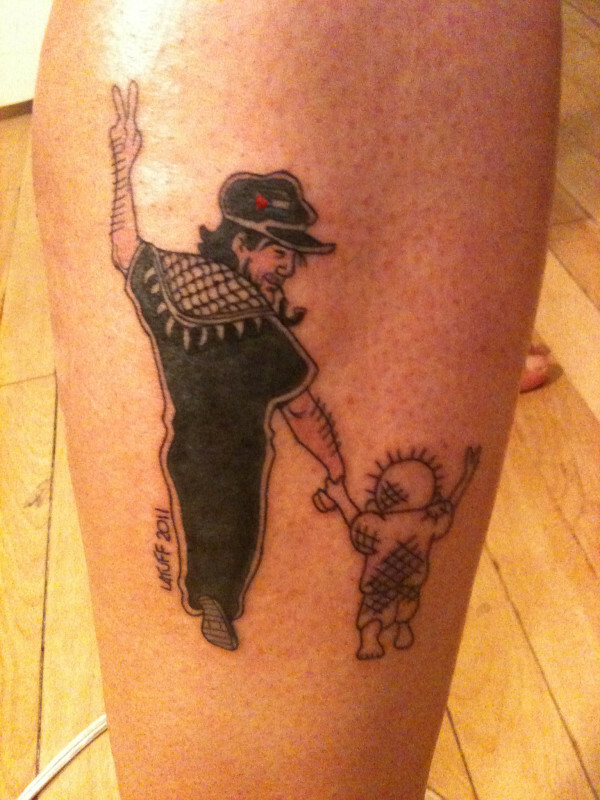 Via Twitter, Amad Nasrallah has sent me a pic of his arm tattooed with one of my Palestine cartoons. The tattoo shown is taken from Carlo’s cartoons, truly an honour for the artist.